Summary: The film as a whole is much more melodramatic than it’s predecessor. Eastwood had proven so successful in his first foray into European Westerns with Fistful… that a follow up sequel was inevitable. Superbly scripted by Luciano Vincenzoni, this film features an unforgettable alliance between ruthless gun-slingers Eastwood as Manco and Lee Van Cleef as Colonel Mortimer and is, in this reviewer’s opinion, the best of the so-called ‘Dollars Trilogy’. For A Few Dollars More tells the tale of a ruthless quest by two bounty hunters to track down the notorious bandit El Indio played by Gian Maria Volonte, who had appeared as one of the villains in Fistfull…, although here he really turns up the evil to eleven. Here Indio is a pot-smoking maniac who takes pleasure in killing men, women and children, while laughing theatrical. A lot. In fact, the film as a whole is much more melodramatic than it’s predecessor, as the action moves from Jail breaks and hold-ups to spectacular gun battles and a fantastically tense final showdown between Volonte and Van Cleef. 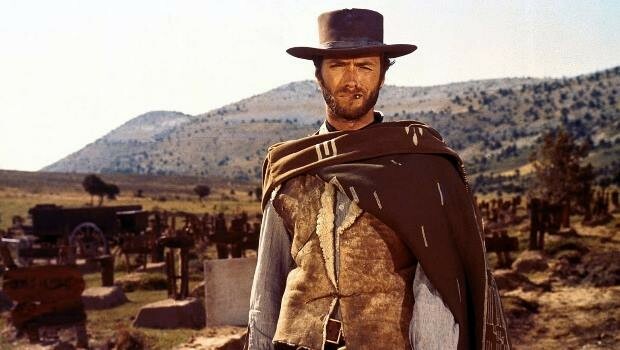 In this film, Leone, Eastwood and Morricone have all become much more confident in their respective art forms and the result is a more satisfying story than A Fistful of Dollars but which is not overlong and meandering like The Good The Bad And The Ugly arguably has a tendency to be.